If you're on the ball this holiday, you've already picked out your gifts for parents, kids, significant others, odd distant relatives, etc. There's a chance you might be forgetting a very special someone. Our four-legged friends are there for us when we need them, so what better way to show our appreciation than to get them a gift this holiday season. We've gone out and found a few gift ideas from various Downtown San Marcos shops that are perfect for showing your love for man's (or woman's) best friend. We all know that dog; they'll eat their kibble, the other dogs' kibble, your mother's shoe, a plastic toy they stole from the baby... 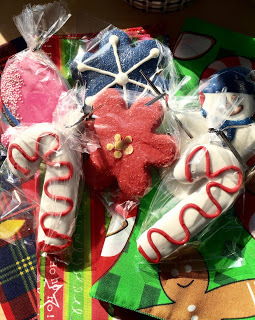 This holiday season you can treat your dog to a snack with a few of these sweet cookies found at Stinky Dawg Wash. These holiday themed treats are $2.25 each. If you prefer to buy your bites in bulk, Stinky Dawg also offers treats that are $0.50/ounce, or a pre-selected bag of treats in a variety of flavors for $3. Who doesn't love a dressed up dog? Even the Grinch dressed Max up in antlers (sure, it wasn't for the best reason, but he still looked adorable) Here are a few outfits that will show off your dog in the best way possible. This cute Barefoot Outfitters tee ($19.95) is super casual and will keep your pup looking sharp. Also in this photo is a Texas State collar ($14.95) and leash ($15.95) because every member of the family should be able to show his collegiate pride. Stinky Dawg Wash also has a variety of clothing options for any occasion your pet might encounter. Each piece varies in price depending on size and style. Every dog deserves to eat like royalty, and with these dog bowls they definitely will. These bowls and treat jars from Stinky Dawg Wash coordinate for an aesthetic that's just so doggone cute. This cartoon bowl is perfect for any lucky pet. It's the one of it's kind at Twice Blessed Consignment Shop. You can grab it for $8. Dogs won't play with your heart, but they'll play with toys. 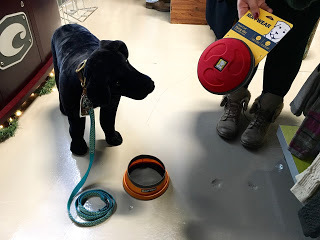 Whether your dog prefers playing fetch (or at least catches the toy even if they never bring it back) or just likes to chew on something, here are a few options that any dog would be lucky to have. Stuff your dog's stocking with a few of these plushies found at Stinky Dawg Wash. Each toy varies in price depending on size and style. Treat your dog as well as they treat you this holiday season. They'll love you no matter what you decide to get them, and that's why they deserve it.